The Dallas Cowboys have reportedly signed ex-Packers receiver Randall Cobb to a one-year deal worth $5 million, effectively making him the league’s 43rd-highest-paid wide receiver in 2019. This comes less than a week after Cole Beasley signed a four-year, $29 million contract with Buffalo. Over the past three seasons with Dallas, Beasley ran 87% of his routes from the slot. Over the past three seasons with Green Bay, Cobb ran 81% of his routes from the slot. I think this signing is exactly what it seems – Cobb will be the salary-saving Beasley replacement for Dallas. On the surface, the landing spot doesn’t seem too exciting for Cobb. He goes from Aaron Rodgers to Dak Prescott, and Beasley saw fewer targets in Dallas than Cobb saw in Green Bay. Over the past three seasons, Beasley ranked just 65th among wide receivers in targets per game (5.3), compared to Cobb’s ranking of 41st (6.4). Beasley also wasn’t very productive on those targets. Over this span, he exceeded 7.5 standard fantasy points in just 17% of his games, double-digit PPR fantasy points in just 36%. Of course, perhaps Cobb is just the superior talent to Beasley (explaining away this differential), but I’m not so sure, and especially not after the sort of prove-it deal he was stuck with after drawing such minimal interest in free agency. 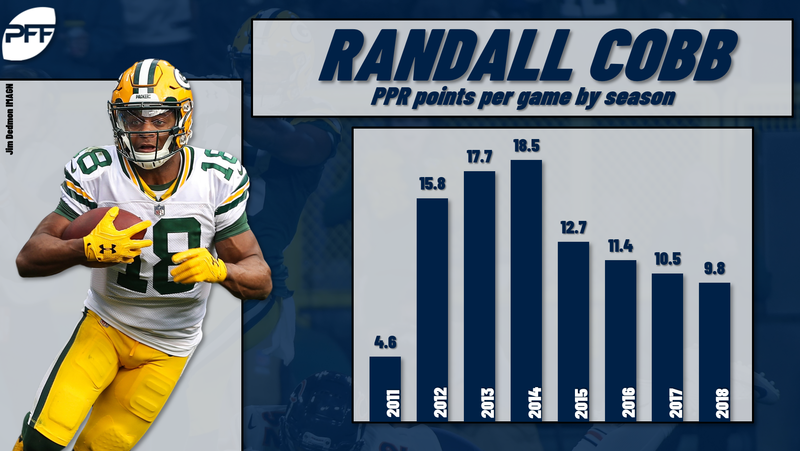 Cobb is a long way removed from his breakout 2014 season, when he finished eighth at the position in PPR points. His 2015 season was almost as good, when he ranked 26th in fantasy points (on two more targets than in 2014). Since then, he’s struggled to meet fantasy relevancy. Over these last three seasons he’s ranked 52nd, 35th, and 81st in total fantasy points, or 45th, 36th, and 56th on a per-game basis. Granted, he’s dealt with a multitude of injuries over that span, spending 35% of those games either inactive or on the injury report. He’s also turning 29 this year, and I suppose that’s a legitimate red flag. Still, it is encouraging that his healthiest season of the three (2017, with just one game on the injury report or inactive) was when he finished 35th. On the other hand, he ranked just 67th of 101 qualifying wide receivers in PFF receiving grade in 2017, and he was even worse last year, grading out 81st of 105 qualifiers. Dallas is a slow-paced, run-heavy team and though Cobb will be second or third on the team’s pecking order for targets (behind Amari Cooper and maybe Michael Gallup), it’s tough to look at this signing through rose-colored glasses. He’s in WR5 territory, offering a high floor but minimal upside.